Whisk the all purpose and whole wheat all purpose flour together in a large bowl, set aside 1 cup of the mixture for kneading and rolling, make a well with the flour in the bowl. Add hot water and begin mixing with a wooden spoon. Add cold water and continue mixing until the dough starts to form a ball. When most of the flour has been incorporated, begin kneading the dough on a floured work surface for 5-7 minutes until the dough is soft, smooth and elastic, adding small amounts of flour until the dough is not sticky. Wrap the dough with plastic wrap and allow to rest 30 minutes at room temperature. Wash, trim, and chop the scallions and place into a medium sized bowl. Add salt and 1.5 tablespoons of oil and mix thoroughly, set aside. When the dough is ready, lightly flour a cutting board and rolling pin, and cut the dough into 4 pieces and gently pat each quarter into the shape of a disk. Preheat a non-stick frying pan on medium heat. Flatten a disk with a rolling pin to 1/4 in thickness, about 7 inches across. Spread 1/4 of salt and onion mixture on the pancake, leaving a 1/2 inch margin around the perimeter, roll up the dough, coil the roll into a circle, and tuck the end of the roll under the dough. Gently flatten the dough with your hand into a circle and then gently flatten the circle into a pancake into a ½-1/4 inch thickness, about 6 inches across (sometimes the green onions ooze out at this stage, it's ok, tuck the green onions back in and for the remaining pancakes, just roll the dough thicker next time around and use less green onions). Spray the frying pan with nonstick cooking spray (or add 1 teaspoon of oil if you don't use non-stick cooking spray) and fry the pancake for 3 minutes until golden brown. 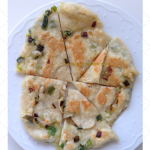 While the first pancake is frying, form the rest of the dough and green onions into pancakes. Flip the pancake over when the bottom is golden brown and crispy (about 3-5 minutes) and pan fry until golden brown and slightly crispy on both sides. Repeat until all the pancakes are assembled and fried. Cut into 8 wedges and serve. This recipe can be made ahead, place a piece of parchment paper between each layer, slide into a resealable gallon sized bag, and freeze. See blog post for a recipe for a simple dipping sauce.